A cold, crisp day made for fast times: Crossing the finish line first is Ruti Aga from Ethiopia winning the women’s division of the 2018 Aramco Houston Half-Marathon. Described as one of the most competitive half-marathons ever run on American soil, the deep field of elite men and women runners competing in Houston always places the long-distance running community on high alert for new American or world records. Each year, the Aramco Houston Half-Marathon unfolds with amazing athletic achievement by elite runners set against the backdrop of thousands of personal stories of recreational unners determined to succeed on the 13.1-mile course. This year’s race on January 14 did not disappoint. that Aramco has served as title sponsor. Billed as an American showdown between Molly Huddle (U.S.) and Jordan Hasay (U.S.), Huddle set a new American record with a time of 1:07:26 — eclipsing a record that had stood since 2006. While the American women’s record was set, the winner of the women’s division overall was Ruti Aga (Ethiopia) with 1:06:39, the second fastest time in race history. In the men’s division, breaking the finish line tape was Jake Robertson (New Zealand), who matched his personal best of 1:00:01 to win the race. Robertson beat out a closely watched pair of contenders from Ethiopia — Feyisa Lelisa and Guye Adola. Lelisa is a two-time champion of the Aramco half-marathon. 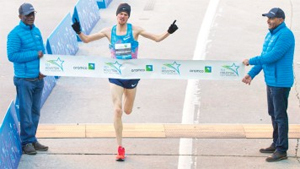 This was the 14th year Aramco served as title sponsor of the half-marathon. “The event has always represented something special to us, but this year it takes on an even greater significance as the City of Houston continues to recover from Hurricane Harvey,” said ASC president and CEO Basil A. Abul-Hamayel during the opening weekend press conference. Aramco employee volunteers and Aramco-sponsored Saudi students have planted trees, packaged food items, and helped in the restoration of area homes with organizations such as Trees for Houston, the Houston Food Bank, Habitat for Humanity, and others to aid in recovery efforts. Aramco’s donations in the community have not only supported the rebuilding of flood-damaged homes, but schools as well, allowing children to return to the classroom. The company also participated in the charitable component of race weekend — the “Run for a Reason” program — selecting as its charity partner Dress for Success, which provides a network of support and professional attire for those needing assistance to enter the workforce. Similarly, many race participants elected to personally dedicate their run to one of the 58 official charities — for some Houstonians that charity had a Hurricane Harvey component.